After days of continuous rains, parts of Haiti's north, including Cap Haïtien, suffered serious flooding, leaving more than a dozen dead and thousands homeless. The Haitian government with the support of the United Nations Stabilization Mission in Haiti (MINUSTAH) and UN agencies including the World Food Programme (WFP), responded with evacuations, temporary shelters and food and supplies distributions. 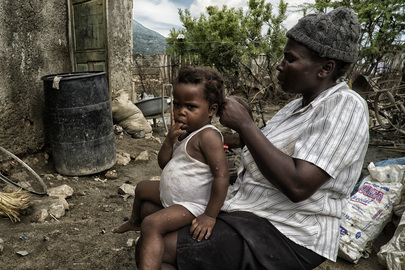 A mother grooms her child's hair in Cap Haïtien, Haiti.